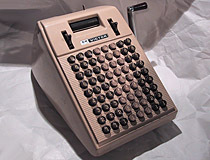 Comptometer-style mechanical calculators were once among the most common and popular forms of adding machine available. Though Felt & Tarrant originally invented and marketed the actual Comptometer brand calculating device, the word 'comptometer' has since become the vernacular. 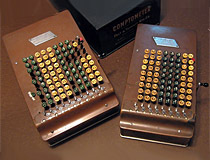 Comptometers are characterized by their massive array of keys. Unlike a modern calculator which only has a single set of numeric keys and forces the user to enter numbers one digit at a time, comptometers have a column of numeric keys for each digit. This allows a skilled operator to add numbers on the machine at a very fast pace, far faster than on a conventional calculator, by striking every column of keys at once. 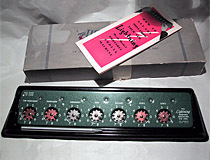 Comptometers are designed primarily for repetitive addition. Though capable of other mathematical operations, execution is not so straightforward. 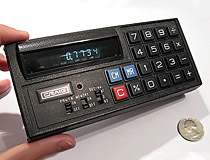 In fact, most of the entities that manufactured Comptometer-style calculators ran academies which companies could send their employees to, in order to learn how to operate these machines. 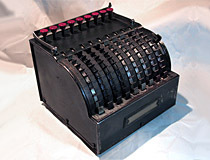 The Lightning Portable Adding Machine is a device commonly referred to as an 'addometer', a popular type of calculator in the 1950s and 1960s due to their low cost and ease of use. Unlike complex comptometers and expensive 10-key calculators, addometer-style machines could be used by practically anyone, with little to no training. The controls of the machine consist of seven perforated wheels which resemble small rotary phone dials. Four of the dials are copper-colored; these dials are the cents and thousands indicators when working with currency. The perforations in the dials are marked with numbers. To perform addition, the user inserts a metal stylus into the appropriate hole and rotates the dials until the stylus catches the hook on the right side of the dial aperture. A small window above each dial displays the sum of the numbers entered into the unit, and a slide on the left side of the machine resets the display to zero. The unit is mounted in an angled bakelite stand for easy use, but is designed to be removed from the stand and placed directly on the document being added when performing long calculations.